The bridge is 123.3 m in length, with three independent spans, each span having four post-tensioned beams. Results from the survey established a requirement for reinforcement work to be carried out across the length and breadth of the bridge. Having remodelled the structure, the decision was taken to restrict loading until refurbishment work could be carried out. From 12 October 2009, the Pont Neuf was closed to all vehicles over 12 tonnes in weight. CCL post-tensioning systems were used to carry out additional external post-tensioning of the structure to reinforce it longitudinally. 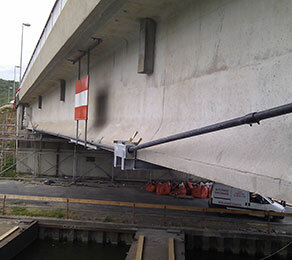 This involved the installation of two 36.21 m strands per beam, which were stressed at one end only. Extra-long lengths of strand were left at the live end after stressing, should de-tensioning or further tensioning be required in future. The strand was coated in wax for corrosion resistance and encased within plastic ducting. The additional strand length was then encased in a specially made, extra-long, protective steel cap. Installation was complicated by the location of one of the bridge supports within the river itself, creating additional access problems which had to be overcome in order to complete the project.